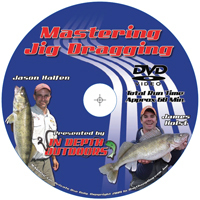 The Draggin’ Jig is the perfect jig for pulling walleyes, bass and panfish from the HEAVIEST COVER! Fish it with live bait or plastics to extract fish from places that used to be off-limits… Features a 1/0 hook, perfect for fishing ’crawlers, leeches, minnows or plastics. The innovative plastics “keeper” holds ’crawlers and plastics securely. Available in three sizes: 1/16, 1/8 & 1/4 ounce and seven unique colors! 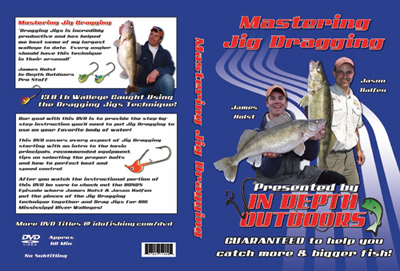 NOW AVAILABLE: Comprehensive Draggin Jig Kit: Click here for more info!! To be fair have to say I have only used them for one day so far. Did not catch anything on them. Dragged one around for most the day until it hung up and I broke it off. Totally my fault, had drag too tight ! I liked how well the jighead holds bait on. Never had to reset the grub back on head. Caught many walleye on these and by far the best I have found. I don't miss many fish on these jigs like all other types of weedless jigs I have used. I lose a few in the timber but thats typical for timber fishing. I might 1 to every 10 of my standard jigheads. I LOVE these Jigs. Excelent for snagging areas. Works great. Draggin Jigs are the best I've found for being weedless. They pull right through the weeds and rarely do I ever lose the bait. We like to cast and jig with a 2" twister tail tipped with a small perch minnow or fat head minnow. Slow retrieve just popping it off the bottom. Good in weeds and even rocks. I would break off 3-4 times as many round jig heads snagged in the rocks to one Draggin jig. They rarely hang up. The longer the bait stays on, the more fish we catch. Bought some to try. They work great and rarely get snagged up . I drag alot of rip tap and rocky shorelines. Best weedless jigs I have used. In the the Rivers I fish there is lots of wood. Great to loose 2 in a day instead of 12 or more conventional jigs in a day. Excellent hook up rate also. Using on lake petenwell in Wisconsin, great in the timber, beats loosing regular jigs and re-tying all the time.